Movavi Screen Capture Studio not only can record every activity on the screen but it also have the capability of recording an audio track that is streaming online. This makes Movavi Screen Capture suitable for recording online audio book. There are a lots of free audio book that you can record on YouTube and at other audio book streaming sites. It is also great for those who are planning to record a podcast and looking for a software that allows then to effectively do so. To record audio from internet you should click the microphone button to go to the Audio Capture module. 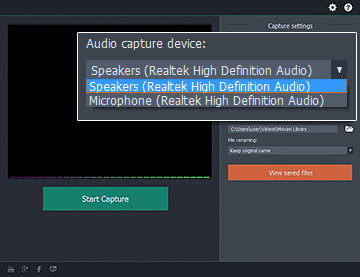 In the Audio Capture module, you can choose whether you want it to record the speakers or microphone input. After choosing the audio capture input, you can type in the file name of the audio recording in which it will be save as. You also have to specify the folder so that you know where to look for the file when it is saved. You should double check to make sure you have chosen the correct settings before clicking on the Start Capture button. If your microphone is detected, the vertical bar will move up and down when you speak onto the microphone. The louder you speak into the microphone, the higher the vertical bar will jump. You should speak at a gentle and just right tone of voice volume when talking on the microphone. You don’t have to be afraid of pausing every now and then when you cannot think of what to say because these blank parts can be deleted with the video editor afterwards. You just say all you want during the podcast recording without have to make sure that everything you say is accurate. If you say anything wrong, you could always use the scissor tool in the video editor to clip off that part. You can re-record the correct version and import it into the timeline and place it in the mistake part that you just deleted from the audio track. You can control the audio recording with hotkeys. Using hotkeys to control the audio recording is better and faster than using mouse. If you use keyboard hotkeys, you won’t capture the mouse click sounds. after finish recording the podcast, you can press the Stop Capture button and the podcast recording will come to a halt. There is no perfect podcast recording that does not have any mistake. Everyone will make more or less a few mistakes when recording a podcast so it makes sense to replay it and check for errors. It is recommended that you play back your podcast 3 – 4 times to check it for errors. You can merge with other podcasts that are already recorded by importing them into the timeline. You can drag the audio track to rearrange them according to the correct sequence. When you are done editing the audio track, you can save it in a MP3 format. You can save the audio track in MP4 if you want to play it on your phone.